Wonder how to get K/DA Kai’Sa? It is available in the League of Legends shop! You can hop right in there and buy it right now and test it! The skin is showcased in the skin review to the right! K/DA is a series of alternate future/universe skins in League of Legends. Set in an alternate universe where the pop music industry has become largely popular. Having a real-life counterpart K/DA performed during the opening ceremony at Worlds. A talent from abroad, Kai’Sa brings a unique style and sound to the industry. She learned to express herself through her craft, blossoming into one of the most talented dancers in the world—a perfect fit for the misfits of K/DA, where she takes their performances to the next level. When the void nature of Kai’Sa meets with her K/DA personality the result is astonishing – Kai’Sa impresses with her new looks, effects and dances as the skin makes much value for the owner, especially for those enjoying the K/DA series. 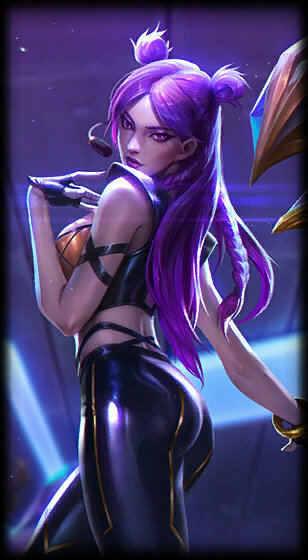 This skin is a part of the K/DA skin line. They always feature amazing updated graphics and animations that make battles ingame absolutely stunning! If you want to check out the new patch, Lolskinshop can help you, we are selling PBE accounts. Note Lolskinshop.com does not sell this skin, never have, and most likely never will! This page is an information page. We have collected all the different parts needed to create one good page that highlights every part of this specific league of legends skin. We would also like to point out that the only way to ever getting this skin is through the official Riot store, where you buy it for Riot points. There is no point looking for it on Ebay or other third party sites, it simply does not exist! K/DA Kai’Sa skin review and information.